We, women, leave no stone unturned to achieve enviable skin and gorgeous hair. But what if a simple oil replaces all our efforts by taking the utmost care of our skin and hair? With primrose oil, it is totally possible. Being an oil with plenty of essential nutrients, it can treat a lot of our beauty issues successfully while keeping our health perfect. So, if you are interested in maintaining your overall health and beauty naturally, consider primrose oil as your elixir. Here is everything you need to know about this wonder ingredient. Primrose Oil or Evening Primrose Oil (EPO) is a golden-yellow colored oil of a thick consistency and a slightly nutty aroma. It is extracted from the pressed seeds of a small plant called Evening Primrose (Oenothera biennis), which is originated from North America and Europe, especially England. It has been named ‘evening primrose oil’ after the dainty yellow flowers of the primrose plant, which bloom in the ‘evening’ (from late afternoon to sunrise) during the spring and summer seasons. The oil is rich in omega-6 fatty acids named linolenic acid (LA) and gamma-linolenic acid (GLA), which get converted into prostaglandins inside the body and support vital processes, such as hormone regulation, cell growth, brain functionalities, reproduction, etc. It is also used widely in the cosmetic industry for preparing skincare and haircare products. Primrose leaves and roots are considered very healthy for humns. Roasted primrose seeds were also used as an alternative to coffee duing World War II. The omega-3 fatty acids in primrose oil can help in balancing the hormonal levels in your body. As a result, you can get rid of a number of difficulties associated with it including premenstrual symptoms and menopausal symptoms (acne, bloating, mood swings, breast tenderness, hot flashes, etc.). The oil is capable of increasing the quality of cervical mucus, which allows the sperms to move easily and freely through the cervix. As it creates a highly fertile ground for sperms, the chances of conception also increase. Oral intake or vaginal insertion of primrose oil supplements can help you induce your own labor after the 37th week of pregnancy. It is also known to reduce the duration of labor. 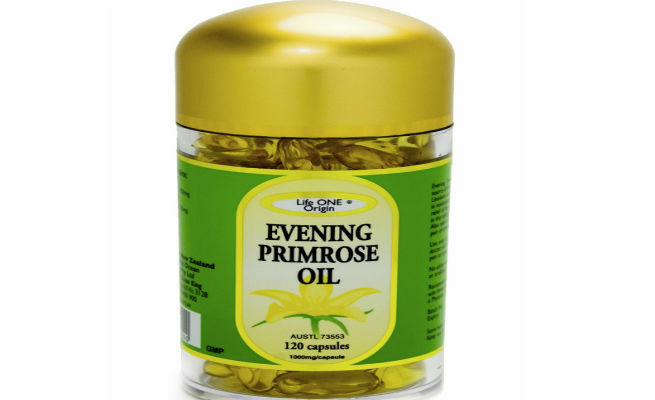 Primrose oil can significantly lower the levels of blood pressure and cholesterol in our body, which helps in maintaining good cardiovascular health. It also has excellent antithrombotic as well as anti-inflammatory properties, which help in preventing strokes and other heart diseases by reducing blood clots. The common symptoms and complications of diabetes can be avoided by using primrose oil regularly. It also reduces nerve pain and averts nerve damage caused by high levels of blood sugar. If you are suffering from osteoporosis, consuming primrose oil in a regular manner will help you manage it effectively. The GLA in the oil can make bones stronger and healthier by improving its mineral density. As a result, you can avoid the risk of fractures. With the regular application of primrose oil, luscious locks will be on your way. Check out how it can help you get healthy hair. The essential oils in primrose oil help in nourishing the scalp. This, in turn, solves issues like dry scalp, dandruff, scalp infections, etc. It helps in strengthening the roots of the hair and nourishing the hair fibers. This prevents frequent hair fall and chronic hair loss. Regular use of primrose oil over a period of three months has been found to increase the growth of hair remarkably. It conditions the hair and improves its texture, thereby making your hair silky soft. Primrose oil can give you gorgeous skin too. Take a look at the ways it enhances the skin health. The essential fatty acids in the primrose oil help in moisturizing the skin and getting rid of dry skin. The oil is gentle and helps in unclogging pores. It also helps soothe any irritation associated with acne. If you are suffering from eczema and other skin infections, primrose oil can be the best remedy for you as it helps get rid of itchiness. Since the oil has anti-inflammatory properties, it is suggested as a treatment for skin redness and rosacea. Massaging the surface of the skin with the oil helps in improving blood circulation, thereby adding a beautiful glow to it. How To Use Primrose Oil? Pure primrose oil comes in bottles and the supplement comes in the form of soft gel capsules. One to three capsules can be consumed per day (after consulting your physician). Alternatively, you can break open the capsule and apply the oil to your skin or hair. Massage your hair with primrose oil and wrap it with a warm towel. This will open up the pores in the scalp and help the oil percolate to your hair roots. Let the hair soak up the oil for an hour or so. Then, rinse with a mild shampoo. If you are using the oil to treat conditions like acne, rosacea or eczema, just soak a cotton ball in it and gently dab on the affected area. Leave it for about half an hour and then, wash off with a gentle cleanser. For improving your skin texture, massage a few drops of the oil onto your face and neck and leave it overnight. Using primrose oil in the recommended dosage for a short span of time is considered completely safe. However, high dosage of the oil can cause side effects like nausea, headache, stomach pain, loose stools, allergies, low blood pressure, hypoglycemia, post-surgery bleeding issues, etc. Consult your doctor immediately if you are experiencing any of these symptoms.